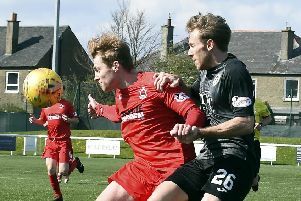 Edinburgh City’s four-match unbeaten run was halted in convincing fashion by Clyde, who ran out 3-0 winners at Ainslie Park. Two quick-fire goals from Kevin Nicoll and Jack Boyle put the Bully Wee two up at the interval before David Goodwillie netted his third goal in two games against City early the second half. Cowdenbeath’s unexpected 2-1 win at Stenhousemuir compounded a bad night for the hosts, cutting the gap between the clubs to ten points. Berwick still separate the two, with City due at Shielfield on Saturday. An early reaction save from Calum Antell prevented Clyde taking the lead after five minutes. The ball fell kindly for Nicoll and the City keeper instinctively threw out a right leg to divert his low close range effort. Craig Beattie vociferously claimed Nicoll had handled before taking advantage of the fortunate bounce. At the other end, Blair Currie got down well to turn Farid El Alagui’s low drive round his near post and out for a corner. El Alagui went close again after a terrific delivery from the right by Craig Thomson, but the former Hibs striker couldn’t quite direct his header on target. City were beginning to build pressure after a bright start from Clyde and Josh Walker’s well hit volley flew narrowly over after a Thomson cross again found El Alagui for a knock-down. A long ball from Beattie caused some hesitation between Dylan Cogill and Currie, who was fortunate that Scott Shepherd’s attempt to nick the bouncing ball round him ricocheted back off the striker and away. Clyde then reasserted themselves and opened the scoring after 20 minutes. Chris McStay’s corner was met by Nicoll at the near post and he headed home from close range. They then doubled their advantage just six minutes later. Boyle collected possession before turning, driving forward and sending a dipping strike low past Antell at his near post. City were struggling to regain a foothold and another Walker hit, this time high and wild from another El Alagui lay-off, was all they managed since Clyde’s two goals. John Dunn fared better with a curling effort from the angle of the box and was unlucky to see it headed off the line with Currie unsure as to where it was heading. El Alagui had another low strike on target as the game edged towards half time, but again Currie was down well at his near post to parry. City found themselves in an identical position at Broadwood earlier in the season, but any hopes of a similar comeback were dashed five minutes after the restart. Goodwillie outpaced Beattie and finished well across Antell into the far corner to put Danny Lennon’s side pretty much out of sight. Chances were at a premium after that. Jesus Garcia strode forward and tried a speculative effort from distance, but Currie saw it all the way and was able to hold. The next opportunity summed up City’s evening. Thomson hit the byline and drove a great ball across the face of goal. It missed El Alagui’s run but fell perfectly for the arriving Gareth Rodger at the back post, who somehow managed to blaze over from just six yards out. Nicoll then put a dampener on his own night by following up his opening goal with a red card, getting a deserved and somewhat needless second yellow for a cynical foul on Dunn. Fit again Ashley Grimes’ strike from the edge of area skewed wide, rounding off the action on a night when nothing went right for James McDonaugh’s team. Edinburgh City: Antell, Walker (Scullion 63), Laird, Thomson, Blues, Beattie, Rodger, El Alagui, Shepherd (Taylor 57), Dunn (Grimes 77), Garcia Tena. Clyde: Currie, Duffie, Stewart, McNiff, Cogill, McStay (Grant 69), Cuddihy, Nicoll, Goodwillie, Boyle (Kipre 76), Lamont (Lowdon 80).